Hello, blog fam... I've had some trouble with my Blogger account so I haven't been able to make any new entries for a while, but if you're connected to me on the myriad other social networks that hold our lives together these days you know that LAGOS DISCO INFERNO is back at ZEBULON this weekend, Saturday July 14... And I am back with it! 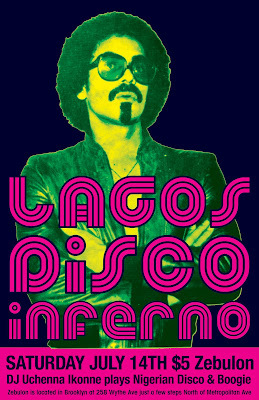 Hopefully you will be back with it too, because I'm looking forward to dropping some serious disco and boogie craziness that I need you to hear... And here's a quick little mix to get your mind right until we meet on the dance floor!